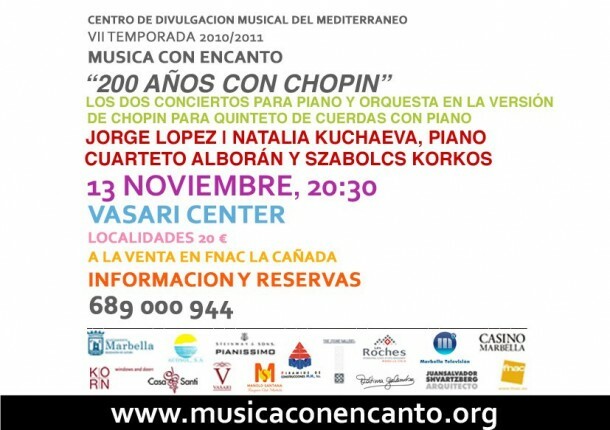 200 Años con Chopin! | Marbella Marbella – Adelante! The most important thing in the sphere of Chopin cult is the work of music itself – tending to it is what requires utmost diligence and attention on our part. I believe, however, that the term that should rather be used here is language, not stereotype – the language of Polishness which Chopin has in such an outstanding, beautiful way recorded in the form of music an intense accumulation of artistic, historical, intellectual senses. Not only through his work, but also because he was such an extraordinary personality of the romanticism, Chopin has become a radiating value – and radiating in an extraordinary way. Chopin’s grand music talent lit up in Warsaw and then dazzled the whole Europe and the world. Since that time the value of this formidable artist’s work has been constantly increasing – and so has his popularity. There is no other composer in whose memory more societies were founded across different continents. His influence on our whole culture made him became a phenomenon: we are talking here of classical music, but also of literature, visual arts, high art and popular art. There are some who call him the Elvis of his time. The two piano concertos(1829 and 1830) are possibly the most important works from Chopin’s piano literature. Both great pianists Jorge Lopez and Natalia Kuchaeva will perform Chopin’s version of these concertos for string quintet and piano, with soloists from OFM as Cuarteto Alborán and Szabolcs Korkos.